Of all the lame excuses, I’ve been putting off registering for this year’s JISC Dev8D conference because the registration form says they’ll be using Wordle to make badges for everyone, and there’s a space on said form to provide a blog/RSS feed or bunch of text which can be fed into it to summarise our interests. I’ve got three personal blogs including this one, although the fact that I only frequently update the one about my musical activities under the alias of Quextal, and that until very recently, Source Of Life, to which I have occasionally released potentially-useful but dreadfully hacky Perl programs, had probably been broken for months, says a lot about the current priorities in my life. Unfortunately, feeding Quextal into Wordfondle fails to give a decent summary of what that site is about. Useful things like the titles of posts, their tags, categories, and the contents of Pages, are all ignored by the analyser, and so the result ends up dominated by the artists who most often feature in the tracklists of my recent mixes. Apart from giving the impression that I’m some kind of music industry plugger / agent / record label boss, it also makes me look like a complete stoner because of my support of one particular artist. Using ContentedLife (wot you are now reading) instead doesn’t fare much better – I guess it conveys quite well something of my tendancy toward an interest in random disparate topics, yet utterly fails to bring out what I consider to be the most important waymarkers within that randomness. If I’m to be represented by a disconnected soup of words, I want at least some of those words to be a reasonable reflection of my real interests and character, leaving room for a bit of serendipity of course. I’d want to relate the fact that I’ve been hacking about with Linux, Perl, PHP and MySQL for so long that I’m about ready now to give the whole lot up and try gardening instead. There’d be (in some cases, necessarily oblique) references to psychedelics and consciousness, healing and mysticism, Now, Spirit, Love, Nature, Gaia, and faeries. Ayahuasca would be explicitly named, for being all of those things while transcending them all. It would make sense to throw in a selection of ideas that I find fascinating and engaging even though I’m never likely to get even close to fully understanding them, such as quantum physics (and metaphysics), fractals, stochastic resonance, sacred geometry, tectonics, astronomy, biochemistry, psychology, geography, weather, and basically anything that seeks to answer the question “How?” (even though we know that the real answer is it’s all just gnomes). And, although it’s not really anything to do with my character (“you are not your job”, as a wise man once said), I suppose it would be sensible — given that this is a conference, after all — to include a couple of phrases about my present paid employment as a Linux sysadmin and developer, which currently involves a fair bit of hacking around with EPrints and other Perl 3 shenanigans. My original plan was to post an entry containing just these tags, repeating the ones I consider most helpful in summation of the mess of contradictions that is Me (psybreaks, for example, would have to recur several times). But while this would generate a more accurate badge, it wouldn’t exactly be an interesting read, and it may also cause search engines to believe that I’m attempting to spam their results. The ranking of this site has suffered enough from the demise of its old domain, I don’t want to get it completely blacklisted. So, the idea now is, to write more entries to explain and expand on many of the terms above. Feeding just this post into Wordmangle (using the single-post feed link) results in a far more apposite summary of my interests than anything I’d hitherto managed. Exactly as I’d hoped. And using an article written about the process to feed into the process appeals to my (and probably every developer’s) aesthetic appreciation of the Meta, the self-referential. With most of the emboldened words above only having a single instance in the text, many of them are getting left out. Perhaps that’s for the best. It seems to be picking a good subset, and while for example I feel Ayahuasca should be in there, so that it can be found by people who are looking, it oughtn’t be too big: it isn’t always a great idea to shout about such things to all and sundry (been there, done that, learned lessons). So I’m generally happy with the outcome. 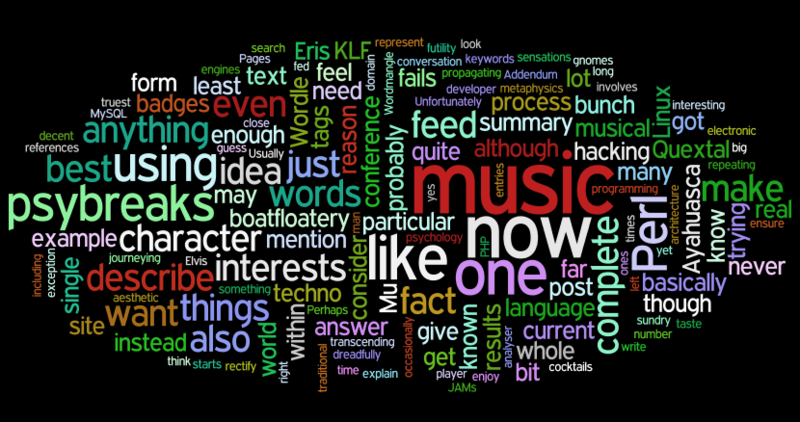 But it omitted The KLF, and Eris. For some reason, I feel they need to be in there, subverting the whole silly idea from within. So now they are. All hail! Fnord.